Most days you will find me actively creating various art pieces in the studio, but sometimes I'm out collecting materials. You are most welcome to come and visit the studio and gallery, but I do request that you contact me to arrange a time to ensure that I will be there to meet with you. Location: 50 Washington Street, Hwy 101, Quilcene, WA. Dancing Cedar Arts will participate in the annual Olympic Art Festival. I will offer original creative artwork for sale. Visitors will have the opportunity to meet and talk with the artist, and purchase their latest work. By visiting, you will learn what inspires their work and how they go about creating their art form. B2 Fine Art Gallery/Studios in Tacoma, WA is exhibiting 5 of Marlien’s large art pieces. Marlien is one of the featured artists of the month. The Gallery gift shop is also selling her smaller pieces such as the frogs. Dancing Cedar Arts will participate in the annual Sequim Art Studio Tour which coincides with the local Lavender Festival. Artists will open their working studios to the public, answer questions, provide demonstrations, and offer their original creative artwork for sale. Visitors will have the opportunity to meet and talk with the artists, see their studios, view demonstrations, and purchase their latest work. By visiting the studios you will learn what inspires their work and how they go about creating their art form. 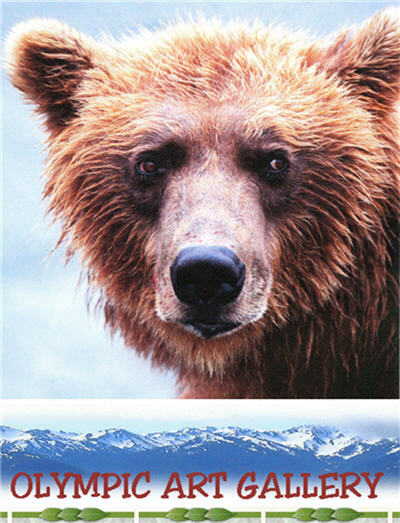 Printed brochures are available at the Sequim Dungeness Valley Chamber of Commerce Visitors Center or as an online download here. 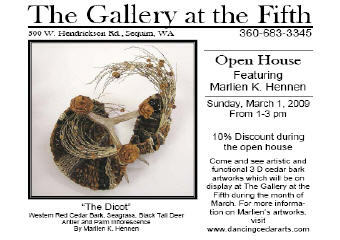 The Museum & Arts Center in Sequim, WA is exhibiting over 30 of Marlien’s art pieces. Marlien is one of the featured artists of the month. The museum gift shop is also selling her smaller pieces such as the frogs, crickets, geckos, fishes, business card holders and little baskets. Information: Museum & Arts Center . The Museum & Arts Center in Sequim, WA is exhibiting Marlien’s 3 light pieces; The Trio, The Marriage and Driftwood Light 2. Information: Fiber Arts Festival Museum & Arts Center . Come to Lavender Central located at Second and Fir Streets in downtown Sequim during the 13th annual Lavender Festival where Marlien will display her artwork as part of the exciting juried booths at the Street Fair. Marlien will answer questions, provide demonstrations, and offer her latest creative artwork for sale. Here is further information about the Lavender Festival. Come meet Marlien and see 20 pieces of her artwork at the Gallery at The Fifth during the open house on the March 1st from 1 to 3 pm. 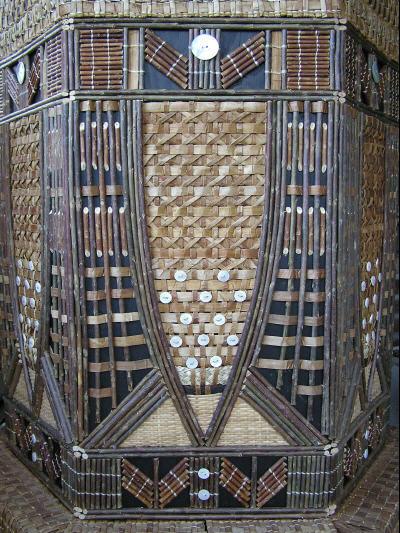 Her work will be on display at The Fifth throughout the month of March 2009. Marlien's wall hanging piece "Thunderbird" was accepted in the 2009 Washington State Juried Art Competition and is displayed for the month of February in The Collective Visions Art Gallery in Bremerton, WA. Dancing Cedar Arts will participate in the annual Sequim Art Studio Tour which coincides with the local Lavender Festival. Artists will open their working studios to the public, answer questions, provide demonstrations, and offer their original creative artwork for sale. Visitors will have the opportunity to meet and talk with the artists, see their studios, view demonstrations, and purchase their latest work.